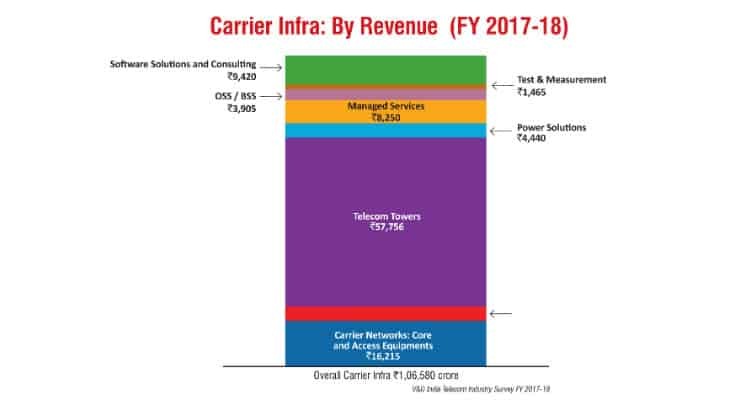 Carrier Infra: Growth by Sub Segment-Future ready! Even in its not so good days, Indian carrier infra has set a benchmark of over Rs 100K Crore. This is the kind of resilience in the market due to the size and volume of the industry. Test and Measurement saw the maximum growth within carrier infra while optical networks and IP integration witnessed the maximum decline during the fiscal. 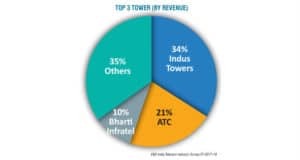 Telecom Towers continued to be the maximum contributor to the segment with over 54% revenue share. The smallest contribution 1.4% came from Test and Measurement segment. The segment overall grew by just 1.1%. 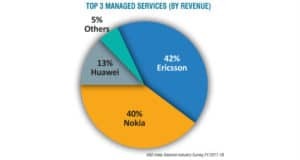 Among the top 3 players within the segment, the top two positions were with the tower companies while Nokia was the only core solutions company figuring in the leadership position. Top 3 players in the segment accounted for 59% the total segment revenues. The core and access equipment segment, the heart of telecommunications, saw 3% growth during the fiscal year. Primarily the growth came in from expansion in 4G by operators, especially incumbents, and the deployments of Massive MIMO or 4G Advanced networks across the country. The other trigger to the activity in this segment was due to implementation of VoLTE services by operators to be able to deliver voice over 4G networks in addition to the data services. This not only allows operators to offer the latest technology available to offer voice but also lets them work out a transition plan to move away from 2G networks, which they can plan to either shut down or use for narrowband IoT applications as may be defined by the business case. 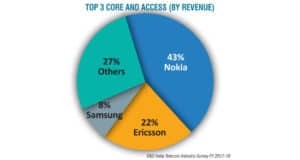 In terms of leaderships in the segment, Nokia continued to strengthen its position in core and access business in India. The key to their growth was due to balanced focus between current requirements and the future opportunities. Contrary to this Ericsson, another significant player in the segment, aligned itself with future technologies like 5G, for which the market is yet not ripe. 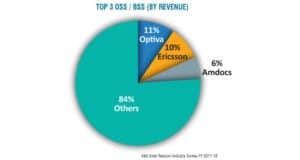 At the same time, Ericsson went through a global restructuring, which is a smart move to reorient before the market gets ready for 5G opportunity. The Chinese players like Huawei and ZTE continued to be the second preference as partners. However, with recent global rethinking, and India also distancing from them by not inviting them for 5G testing and trials, the future of these companies is yet in dark. What needs to be seen is will the price sensitive markets like India be able to sustain without their support as the operators don’t have deep pockets to go only with Tier 1 core and access equipment vendors. In the past as well, government had stopped allowing Chinese vendors to supply equipment, but then they had relax it, and state run BSNL / MTNL were the major beneficiaries as the extensively use these operators. The operators continued to move on to IP technologies as well as saw further densification of fibre in the networks. These become essential as the entire telecom services are moving from legacy PSTN to IP based NGN networks. The shift to IP gives operators benefits of being pure digital as well as they are able to reap the fruits of convergence, which is only possible over an IP network. The segment will continue to exhibit high order double digit growths in future as well. All the operators across the country are going for Fibre and IP integration at the core levels. This is facilitating the operators to be future ready and also forming the base for upcoming 5G technology. The top 3 players in the segment are very closely competing with each other and contribute over 95% of the total segment revenues. 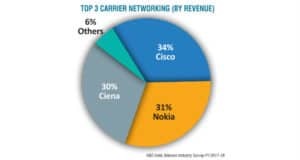 Since, all of these three players have very unique propositions in this segment, which are in some ways non-competing, the players will continue to exhibit similar or even higher growths for next 2-3 years due to heavy focus and investment of operators in fibre and IP technologies at the core level of networks. As the value moves on from pure infrastructure to the kind of applications operators deliver along with the experience that customer is able to feel, the infrastructure not only further looks as a dump passive network element, but operators have also started divesting from the segment through their infrastructure businesses. This segment as well seems to exhibit the similar trends as of overall telecom, where only a few players can sustain. After the overall telecom on the operator side, passive infrastructure has been the second segment that has seen maximum reorientation in terms of mergers and acquisition and divestment of operators from the infrastructure business. The trend is encouraging for the pure play tower companies, which will become stronger and can focus on providing infrastructure to the operators, who will continue to move away from the infrastructure. However, the state run BSNL/MTNL would continue to have their own infrastructure. From the technology perspective, the focus of the industry would continue to provider greener solutions and work out technology solutions to further facilitate infrastructure sharing and increasing tenancy. The outlook for the segment would continue to be positive as with the kind of expansion plans of operators for 4G, 4G advanced and early proliferation of 5G, would see tower densification as well as expansion of coverage. There was nothing remarkable to notice in this segment and it was mostly business as usual. The solution providers are working on providing alternative and greener off grid solutions to the telecom industry and this is likely to grow. But the upfront investments in such solutions is the biggest inhibitor, especially at a time, when the operators don’t have money to invest. Power solution is not a core investment area for operators. This fiscal operators were very selective in investments and made investments only where necessary and unavoidable. This could be seen as a reactive investment strategy rather than of being proactive. 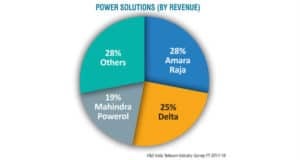 With this strategy in mind, power solutions were among the last to be considered, and it is being reflected in the growth of the segment as well. However, as new tower sites are expected to come up with operators planning to densify and expand networks, the current decline can be seen as a momentary trend. The shift towards greener and alternative solutions might not be of the expected levels as operators are still not finding investing in them as a feasible plan. It might get a push if the power companies are able to come up with innovative business models where they partner in development rather than just being suppliers. Though this year the de-growth was due to other reasons like many of the operators winding up the operations, managed services does not seem to be a long standing business proposition. Even with 5G coming, there might be some momentary growth in the segment, for operators to get acquainted with the latest technologies. But, as networks become intelligent, self-servicing and more of software defined, the current definition and scope of managed services would not remain the same. There would still be need to have a different kind of managed service, but that might be more from IT point of view than pure telecom. For instance, in case of virtualised and software defined networks, operators might initially go with a hybrid model of using automated as well as manually driven networks that will reconstruct themselves as per the needs of the subscribers – individuals as well as enterprises. However, the automation and the level of intelligence the solutions would have, the shift is gradually going to be self-servicing by the network elements with minimalistic human intervention. As the market consolidates, and the business models of solution providers change, the pure vendor plus managed services layer would also redefine. For the purpose, telecom infra vendors like Nokia and Ericsson have already made a lot of software acquisitions which will help them offer infrastructure with a servicing model. This would redefine the present day managed services and we may get to see something similar to infrastructure as a service or platform as a service in telecom as well. This segment saw growth for the solution providers who were positioned to leverage from the growing opportunities in the data segment of telecom services. Not only due to increase in data deployments, but also due to huge increase in the data services, the OSS / BSS elements of the network required intense augmentation that was facilitated by the solution providers. as operators provisioned services based on data like content on demand, etc., this also resulted in increased opportunities for the solution providers. The OSS / BSS opportunity outlook is positive and it is expected to see a double digit growth for next couple of years. As many operators will now have more of data driven services and at the same time, explore connected offerings for IoT and M2M, the OSS / BSS solution needs are only going to grow. However, key to success would remain offering flexibility in the architecture and scalability, which would of course come from cloud based solutions. At the same time, the OSS / BSS solutions must allow operators to provision services in the fastest possible time and create complex revenue models that would also have an added layer of revenue assurances. Due to increased complexities in the OSS / BSS solutions, it appears that standalone companies are going to have larger opportunities compared to the companies that are offering a lot more beyond OSS / BSS. The operators have become real time R&D centres as they want to deploy the newer services over data in the quickest possible time and start monetising. Due to hyper competition, it becomes critical to achieve the first move advantage. 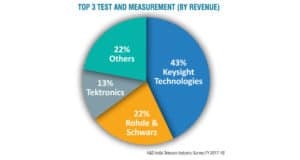 These factors have increased the significance of Test and Measurement devices for telecom. There have already been widespread 4G installations and in many circles these have been upgraded to 4G Advanced. These data oriented networks demand a great deal of tests to be performed to achieve the desired results in terms of signal strengths, payload capacities, etc. At the same time, operators have been engaged in rolling out VoLTE that helps them to manage both voice as well as data services over a 4G network. Deployment of VoLTE also triggered need for more test and measurement equipment. There are still challenges like call drops, heterogeneous availability of data services, etc., that operators are attempting to overcome with one or the other technique. For this, a lot of tests are being conducted after augmenting the services to fine tune and optimise the networks. Test and measurement is going to be another exciting segment for a couple of years in India, especially in the backdrop of 5G being pursued aggressively. Both the government and the industry want 5G to be deployed and see India figuring in the leading nations to deploy the next generation of LTE. The software solutions and consulting services for the telecom operators also saw modest growth, but with increased and new dimensions. The earlier conversations would be of very limited scope and there used to be some rudimentary applications developed to push VAS content, etc. At the same time, consultancy would also be limited in scope, primarily focused around bettering the existing solutions and services. With data becoming the focal point in telecom, the consulting services were mainly for monetisation, and evaluating feasibility of use cases where operators could add to the revenue streams. This also meant transition of legacy VAS to new age OTT based VAS services for operators, which is being seen as a potential revenue generator for them consuming great amounts of data. The entire telecom value chain is seeing a new and critical role for the software. Earlier the software would be added as a layer over the core telecom systems. Now, the software is getting more into the core with shifts in architecture like adoption of IMS, network virtualisation and software defined and managed networks. 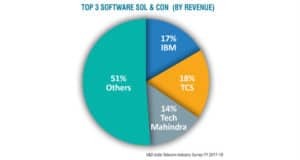 The traditionally strong software solution companies like TCS and Tech Mahindra, who have been catering to the global operator needs, do see the domestic market also becoming exciting for them. Players like these, have an edge over others as they have been working in the telecom domain for several years and have a fair understanding of how the interworking of IT and Telecom can be leveraged by telecom operators to create highest levels of customer experiences. 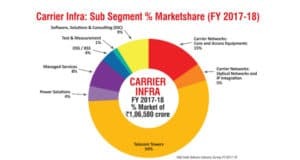 Carrier Infra: Growth by Sub Segment-Future ready! 0 out of 5 based on 0 ratings. 0 user reviews. User Devices: Growth by Sub Segment- India continues to connect, smartly!